Katja gets up before me, as usual, but the wind and rain outside chases her back into bed. She tried to go outside so she could enjoy the morning out on the terrace, but as described, the rain and wind is to strong. We do a workout down in the gym and when we’re back up in the room the weather is much better. Getting fired up by four supersets really get my appetite up. Breakfast is awesome. It’s been ages since I had decent bacon, but wait no more. I’m in good hands here. We spend the rest of the morning and into midday by the pool now that the weather is better. There’s still heavy gusts of wind and we got a little rain but nothing bad. We’ve both started on a book called Bhagavad Gita. An ancient Indian text describing a war. It’s a poem of sorts, but is deep on so many levels. It’s said to be one of the main texts to read to start understanding Hinduism. Enjoyable from as philosophic perspective as well as a religious one. Destruction, rebirth, devotion, honor and duty. Thousands of years old and with the right interpretation just as important today. Enjoying a beer for lunch. When did that happen last? 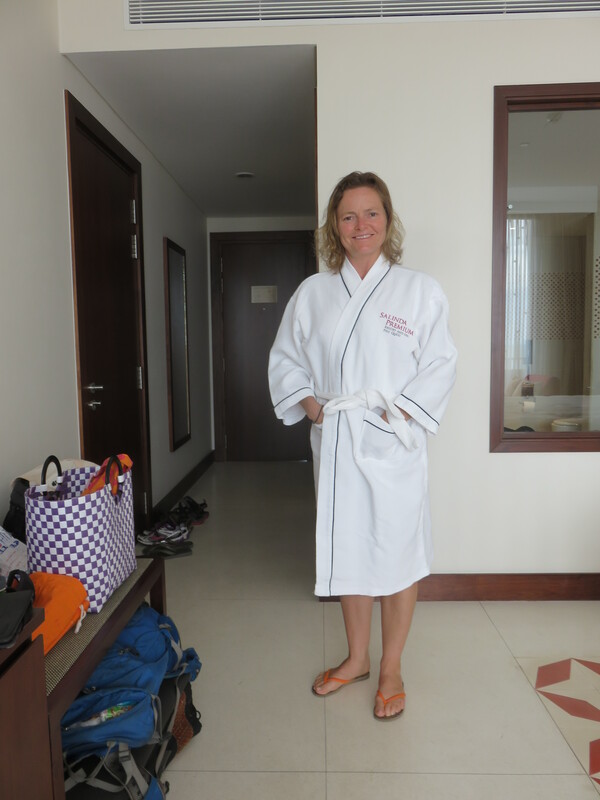 Katja takes a tour to the spa and after two hours come back rejuvenated. At least they called the treatment that. We eat Indian dinner here at the hotel. It’s an Indian chef recently hired and we heard good things about the food. I have had chicken tikka masala on four continents but nothing compares to this. An exquisite combination of spicy and flavor. A little sting, but with the rich flavor if the curry. Absolutely brilliant. Chapati bread instead of Naan. Very good. We speak to a couple of the waiters and it turns out there are five Moldovians here. Three cooks and two waiters. You know where Moldova is, right? Squeezed in between Romania and Ukraine. Probably didn’t do you much good so pull up Google maps as I did. We’re back in the room at eight thirty and post a couple of blog posts before turning in. Tomorrow is our tenth wedding anniversary and it’ll be a grand day. I remember the day I proposed and the day we married. Well at least most of the day we married. My father-in-law had a couple of champagne bottles delivered to our room that topped off the day’s festivities. A few hours is a bit blurry after that. We got married at the Norwegian embassy in Stockholm with Katja’s maid of honor Elisabeth, my best man Per Kristian and his wife Charlotte. Away from everyone else just to celebrate the two of us. Now we’re “all alone” on the other side of the world from family and friends. I’m still in the world’s best company, and we’ll celebrate the two of us tomorrow. But I do think we’ll kick up a party right after we get home to be happy and have fun with friends and family again.